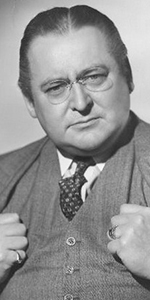 Edward Arnold was a major supporting player in films of the 1930s, most notably as the heavy in Mr. Smith Goes to Washington (released in October, 1939). Unmistakable in any costume, his smooth voice and manner of expression (along with the pince-nez glasses), made him movie short-hand for "villian." The son of German immagants, Gunther grew up on the Lower East Side of Manhattan. He became interested in acting from an early age, appearing as Lorenzo in a production of The Merchant of Venice at the age of 12, then making his professional debut in 1907, at age 17. He began hanging around the movie studios in Fort Lee, New Jersey, where he got extra work, eventually landing a larger role in The Misleading Lady, with Edna Mayo (released in January, 1916). Arnold made many films in 1916 and 1917. He got married in 1917 and fathered three children. Arnold focused on the stage thoughout the 1920s, appearing in a number of successful Broadway shows, including playing the role of the producer Harry Lee opposite George Jessel in the revival of The Jazz Singer in April, 1927. But when the movies found their voices in the early 1930s, newly divorced Arnold was there, to resume his film career. His first picture was Okay America! (released in September, 1932), with Lew Ayres at Universal, then made a film of one of his Broadway plays, Whistling in the Dark (released in January, 1933) for M-G-M, where he played a gangster. All actors wait for that role that they "were born to play." For Arnold, that role was that of Diamond Jim Brady in Diamond Jim (released in September, 1935) for Universal, and for which, he recieved top billing (over Jean Arthur!). Arnold was a star now. He played the lead in the adaptation of Edna Ferber's Come and Get It (released, in November, 1936) for Goldwyn, and played John Sutter in Sutter's Gold (released in March, 1936) for Universal. Arnold was tapped to play the title detective in Meet Nero Wolfe (released in July, 1936) for Columbia. Hard to belive, but Arnold got top billing over Cary Grant in The Toast of New York (released in July, 1937) for R-K-O. Fond of good food and the ladies, Arnold decided to forget about being a leading man, and focused on supporting roles: "The bigger I got, the better character roles I received." He played the heavy in director Frank Capra's You Can't Take it with You (released in September, 1938) for Columbia, played the heavy Jim Taylor in his most iconic role in Capra's Mr. Smith Goes to Washington (released in October, 1939) also for Columbia. He got to play Diamond Jim Brady again in the film Lillian Russel (which played the Chinese in May, 1940) for 20th, and played another wheeler-dealer in Meet John Doe (released in May, 1941) for Columbia. But he returned to headliner status in The Devil and Daniel Webster (released in October, 1941) for R-K-O. Arnold was the president of the Screen Actors Guild from 1940 to 1942). 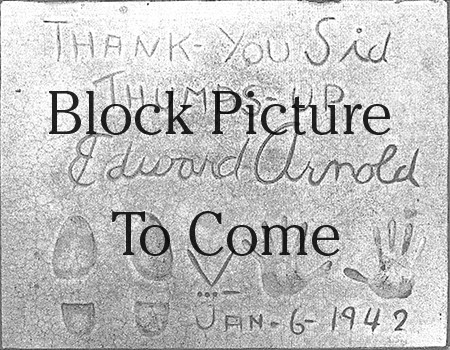 So Edward Arnold had been a rather big star when he laid down his footprints at the Chinese in January of 1942. in October, Arnold was tapped to play the blind detective Duncan Maclain in the film Eyes of the Night (played the Chinese in December, 1942), and its sequel The Hidden Eye (played the Chinese in March, 1946), both for M-G-M. He got a meaty role in the film of Annie Get Your Gun (released in May, 1950). Naturally, someone as avuncular and stereotyped as Arnold would become a darling of the Republican Party, which was considering putting him up for U.S. Sentator. He narrowly lost being elected to the Los Angeles County Board of Supervisors, saying at the time, that he thought that perhaps actors shouldn't become politicians. Arnold was active in radio as well, starring in the program Mr. President on ABC, running from 1947 to 1953, and on The Charlotte Greenwood Show on ABC in 1944, and on NBC from 1944 to 1946. He hosted the Spotlight Story on the Mutual network in 1953. Television saw him as host of Your Star Showcase in syndication in 1954. Arnold died at his home from a cerebral hemorrhage at the age of 66.